A rich, full-bodied demi-glace takes a lot of time, attention and quality ingredients. Made with real, quality ingredients, Knorr Demi Glace can be created in just 5 minutes. Basic brown sauce. Best for Classical French & Spanish cuisines. 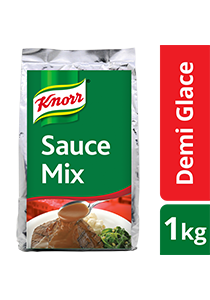 Dissolve 100g of Knorr Demi Glace Mix to 1L of water. Bring to boil while stirring and simmer for 3 to 5 minutes. Ideal as a sauce for steaks.